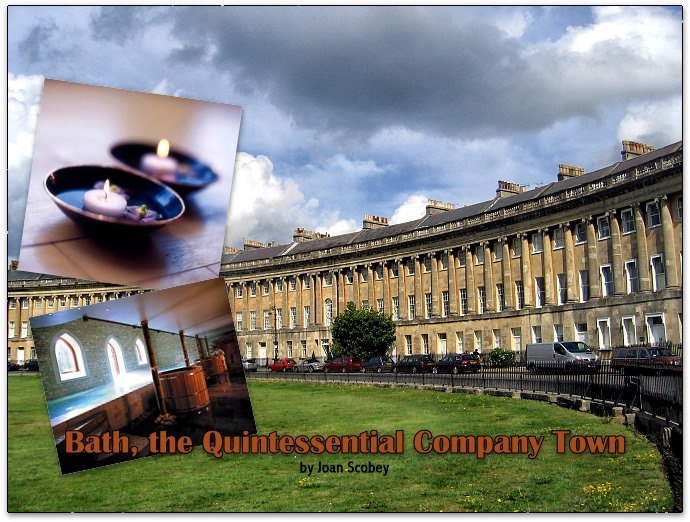 f ever there was a company town, it’s Bath, England. And just so there’s no mistaking it, even the railroad station is named Bath Spa. Centuries before Jane Austen turned a spotlight on this elegant city in southwest Britain, its hot springs--the only ones in the United Kingdom, incidentally--played a part in its history. The Romans were among the first but not the last to discover their health-giving properties. Sixteenth century Elizabethans came to soak in the hot mineral-rich springs, and 18th century Georgians enclosed the Roman baths in elegant structures that became a center of their social life. In 1978 the Great Bath was closed for public bathing, but visitors can still soak in the original underground hot springs, which are now channeled into the pools of the newly opened state-of-the-art Thermae Bath Spa (see Worldwide Spa Review, Nov-Dec 2006). Georgian houses around a great lawn, and the Circus, a ring of Georgian townhouses; the Assembly Rooms, the social center of Georgian Bath that now houses the Museum of Costume; Great Pulteney Bridge over the River Avon, which, like the Pontevecchio in Florence, is lined with shops on both sides; Abbey Church, with its soaring Gothic ceiling; the medieval Sally Lunn House, where you can still get her famous buns; and the Jane Austen Centre that brings 18th century Bath to life. In addition to the public Thermae Bath Spa, visitors today happily have a choice of three private spas, each at an immensely attractive hotel: The Royal Crescent Hotel, in the very center of that Georgian masterpiece; the Macdonald Bath Spa Hotel, a spacious 18th century mansion in seven acres of landscaped gardens; and The Bath Priory, a charming 19th century country house hotel with four acres of gardens on the outskirts of town. Let’s start at The Royal Crescent Hotel, so integral to the sweep of those thirty identical buildings that the only clue to its front door is the 150-year-old magnolia tree in front, the only planting along the street. The welcome begins in the front hall, the fireplaces in the public rooms, with their exquisite 18th century antiques and paintings of royals, even in the wooden pineapple of welcome on the keys to the 45 rooms and suites. Through the tranquil back gardens lies The Bath House, its bamboo covered poles, pebbly rocks, stone floors, and light and dark woods creating a serene haven of contemporary tranquility, anachronistically created from a converted 18th century coach house and stables. The ground floor is for wet treatments: steam, sauna, and a relaxation pool with Gothic arched windows where steam romantically rises from the 100 degrees F waters next to cold and tepid plunge teak–lined tubs. A balcony overlooking the pool has lounges and four massage rooms. “Call it a holistic spa,” suggested a spa therapist. Focusing on the natural elements of Earth, Air, Fire and Water, The Bath House embraces both ancient and contemporary spa culture in an extensive range of traditional and progressive holistic therapies, from soothing massages to full aromatherapy facials, and from fruit enzyme wraps to holistic foot and nail treatments. 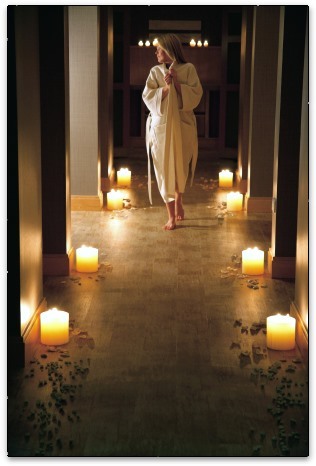 THE BATH HOUSE EARTH AND STONE TREATMENT (75 minutes £90). A hot stone massage removes tension from the back, neck and shoulders while mud, from Eastern Europe, detoxifies, and a cold stone facial massage ends the treatment. SAGAMI (2 hours £140). An algae body wrap promoting weight reducing and detoxifying that includes a full body exfoliation and a lymphatic massage to boost the immune system. THE BATH HOUSE TURKISH HAMAM EXPERIENCE (1 hour 30 minutes £100). Bathing and cleansing rituals in the steam room and plunge pool, plus a full body exfoliation and a deep cleansing massage. FRUIT ENZYME WRAP (1 hour 40 minutes £105). A mouth watering treatment involving a yoghurt, honey and coconut salt scrub, an avocado or strawberry mask, and a skin cleansing treatment of Grapefruit Contour Cream. DETOXIFYING ALGAE BODY WRAP (1 hour 30 minutes £125). STONE COLD WRAP (1 hour 15 minutes £90). A therapy for people with cellulite, water retention, varicose veins, and circulatory problems utilizing nettle, eucalyptus, menthol, and camphor, to increase circulation and detoxify. THE RADIANCE FACIAL (55 minutes £60). Botanical products promote lymphatic drainage to alleviate puffiness and re–oxygenate the facial tissues. LUXURY AROMATHERAPY FACIAL (1 hour 10 minutes £75). . THE ATLANTIS MALE FACIAL (55 minutes £60). REVITALISING BACK, FACE AND SCALP MASSAGE, 1 hour 20 minutes £90. This treatment commences with a deep cleanse of the back with our sea salt and essential oils exfoliator which flows into a soothing back massage. A facial cleanse, massage and masque, combining ingredients such as rose, green tea, honey and amyris follows, culminating in a blissful scalp massage. 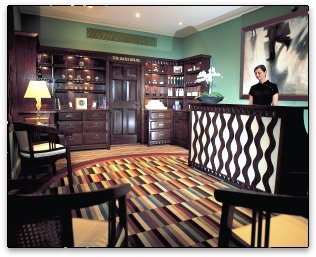 THE BATH HOUSE DUALITY FACIAL (2 hours £160). A Radiance or Atlantis Male facial and a simultaneous hand and foot Reflexology treatment performed by two therapists. WATSU (1 hour 10 minutes £75). 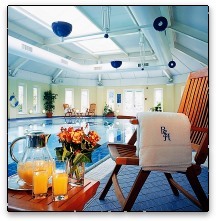 A deeply relaxing water treatment employing shiatsu and hydrotherapy in the warm pool. THAI MASSAGE (1 hour 25 minutes £75). A transformational combination of yoga and acupressure stimulates energy and yet instills a sense of calm. REIKI (55 minutes £60). A subtle Japanese form of energy balancing. INDIAN HEAD MASSAGE (40 minutes £50). 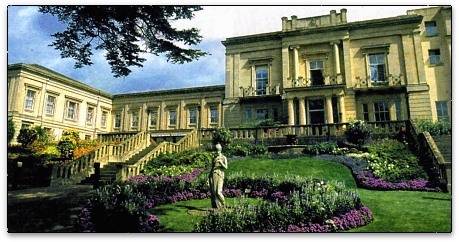 In a residential area across the River Avon, a long driveway and twin staircases flanking lovely plantings lead up to the columned entrance of the Macdonald Bath Spa Hotel. It reopened in late 2006 after a major $20 million renovation that included $6 million for an ambitious new spa. There are five new treatment rooms, three of them with showers, including a large room for couples or to accommodate disabled guests, plus facilities for manicures, pedicures, make-up, and hairdressing. One of the wow installations is the Thermal Suite which, evoking the ancient Roman custom of going from a hot room (Caldarium) to a cold room (Frigidarium), has a rock sauna, an infrared heat cabin, a salt infusion room, an aroma steam room, and an ice room with a big cone of chipped ice. In addition, there is a 55-foot indoor swimming pool, a Jacuzzi and an outdoor hydrotherapy pool for underwater massages. The gym has TechnoGym cardio and resistance equipment, including free and machine weights, crosstrainers, treadmills, rowing machines and stationary bikes. HIGHLAND HEALING (100 minutes £130). A full-body relaxation treatment combining Celtic hot stones with an aromatic heather blossom peeling, a seabuckthorn massage, and a restorative pressure point facial massage. GOLD ELIXIR (85 minutes £95). An anti-ageing facial that utilizes multi-active ingredients of High Skin Refiner products to minimize environmental damage and protect the skin. SEA INFINITY (90 minutes £130), A facial using rare ingredients harvested from the seas, worked deep into the layers of your skin with a specially-created sea shell massage. CLEOPATRA NOURISHING MILK EXPERIENCE (85 minutes £85). A full body treatment using the moisturizing properties of milk to calm and regenerate irritated skin, from exfoliation to the milk body cream massage. The extensive spa menu is almost overwhelming, and I chose yet another signature body treatment, the Scentao-- East Meets West (100 min, L130), seduced by its description of “an exotic treatment that brings Far Eastern philosophy to you ...and takes you on a journey that enhances the spirit and the inner soul, enveloping you in total harmony.” Basically it looked like a hot stone massage with an Asian spin that ends with shiatsu strokes along invisible energy channels, but I was game. Here’s how it went. First came a tea ritual, a few small sips of a brew I selected among the following teas: lemon balm for relaxing, sage for detoxing, and rosemary for energy (my choice). Then, as I lay on my back, the therapist sprayed a cleansing liquid on my feet and body, and sponged it off. She inserted lava stones between my toes, and placed more on my chest and abdomen. She smoothed a warm mixture of hot almond oil and green tea, ginseng and ginkgo biloba over my body, and gently massaged it with smooth strokes of hot lava stones.She broke open a Scentao ampoule to cleanse and peel my face, then gave me a pressure point facial massage, followed by a scalp massage. At this point I turned over for a back massage with the warm oil mixture and the hot lava stones, followed by a hands-on shiatsu pressure point massage. Fabulous. So fabulously relaxing I looked over the extensive spa menu to plan a return visit. ABYHANGA AYURVEDIC MASSAGE (85 minutes £95). AROMA BODY TREATMENT (85 minutes £95). HERBAL SOOTHING BACK TREATMENT (55 minutes £80). THE SPA BODY COCKTAIL (85 minutes £115). After an invigorating exfoliation to stimulate circulation, the rich body butter cocktail melts into the skin to strengthen its defenses and protect it against the effect of light-induced ageing. VOLCANIC HEAT PACK (55 minutes £80). A warm Eifelfango mud to re-mineralize and refine the skin. ANTI-CELLULITE TREATMENT (55 minutes £85.00). An invigorating salt peel and self-heating Thermo Modelage mask to stimulate circulation and reduce the appearance of cellulite. 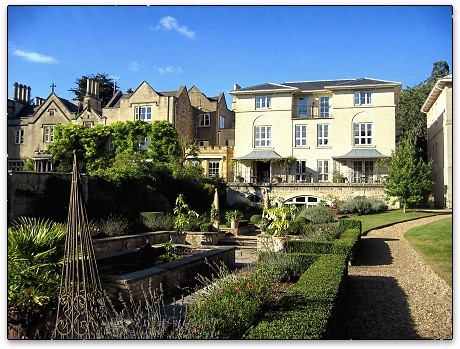 The third hotel spa option, at The Bath Priory, offers the intimacy of a quintessentially English private home, from the thirty one botanically named hotel rooms to its croquet lawns, herbaceous borders, and Victorian kitchen garden that supplies its Michelin-starred restaurant. There are three treatment rooms, indoor and outdoor heated pools, a gym, sauna, steam room, and solarium. If Bath has a cornucopia of medieval, Gothic, and Georgian treasures to explore, its hotels and their spas also present enticingly seductive choices. It’s a city with an embarrassment of riches, but who’s complaining? There are 45 individually designed rooms in several buildings flanking the gardens; doubles from £320 include full English breakfast and Value Added Tax. There are 129 rooms, with doubles starting between £120 and £249, depending on dates. Thirty one rooms and suites, with doubles starting at L245 (L215 off peak), including full English breakfast and VAT.